AFLW Highlights: Our final game Watch all the key moments from Collingwood's loss to Adelaide in the final round of the 2017 AFL Women's competition. 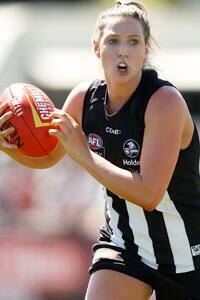 Amelia Barden was one of Collingwood's best through the midfield. Adelaide has booked its spot in the inaugural AFL Women's Grand Final against the Brisbane Lions, with a come-from-behind 24-point win over Collingwood at the Holden Centre on Sunday afternoon. The Crows were led superbly by cult figure Sarah 'Tex' Perkins and MVP contender Erin Phillips, who booted seven goals between them in the inspired 10.10 (70) to 7.4 (46) victory. Phillips finished with a game-high 21 disposals and three goals, two of them coming when the game was on the line in the final term. Perkins was equally influential, particularly early in the game as she put together a sensational second-quarter burst that saw her collect seven disposals, take three marks and boot a goal to give her side the ascendancy at half-time. Midfielder Ebony Marinoff was also pivotal in the victory, thriving around stoppages to finish with 17 disposals and 11 tackles. The Crows had to beat the Magpies to earn a place in the decider after Melbourne's comprehensive win over Fremantle saw the Demons leap up to second position on the ladder. Melbourne's women's players watching on would have been buoyed by the Magpies' third-quarter comeback, as Collingwood took a seven-point buffer into three-quarter time. Captain Steph Chiocci (13 touches) and Sarah D'Arcy (13) were typically productive in the third quarter, while former Australian cricketer Jess Cameron and marquee forward Moana Hope each finished with two goals. But thanks largely to Phillips and Perkins, the Crows kicked five goals to nil in the final term to win their way into next Saturday's Grand Final. We'll be back bigger + stronger.